From the earliest years of Christian worship, the faithful have covered religious symbols—whether crosses, statuary, or paintings, from the Fifth Sunday of Lent through Good Friday. It used to be on the Sunday before Palm Sunday that the church would hear read the entire passion narrative, and so from that point during the liturgical year, through the end of Holy Week, crosses especially, but any symbol of God’s revelation to humanity, would be covered with a veil to remind us of the veil which was torn in two, according to Matthew, at the moment that Jesus died. Now, we cover the crosses throughout Lent here at Trinity, and other Episcopal, Lutheran, and Roman Catholic parishes observe a similar tradition; there isn’t a set rule about exactly how far in advance such items should be veiled, though Ash Wednesday, when we cover up the crosses, is the earliest appropriate moment. The veil which was torn in two was the huge cloth curtain that divided the Holy of Holies in the Temple from the rest of the temple’s sacred space. In the Temple of Jesus’ time, there were three parts—the temple courts where anyone could walk around (this is where the money-changers were, who Jesus threw out), the Holy Place where only ritually-pure Jewish men could go, and the Most Holy Place or Holy of Holies where the Temple priests would dare to go only once a year to offer sacrifice on the altar. This is where we get the altar rail—that is a symbol of where it used to be that no one could cross, or even see very well, what was beyond. Because of Jesus’ willing sacrifice of himself on the cross for our own sins and waywardness, veil—the separation, physically and spiritually—of God from humanity, no longer exists. When I was growing up, I belonged to and served a church that met in an elementary school’s cafeteria. Being part of a church plant for most of my young life significantly formed the way I understood “church”–I was a Sunday School teacher for elementary students sometimes, though mostly I played guitar on the worship team. A high schooler was able and allowed to help lead the entire congregation in worship, or to plan and lead a Sunday School lesson, because there weren’t a lot of other people available to do it. I was given the opportunity to lead and to teach before I was able to drive! Somehow, ten years later, I’ve ended up serving in a church with a huge, impressive building, though I’m still leading worship and teaching Sunday School. There’s a great energy, freshness, and openness in church plants, young church communities, and groups not saddled with an arduous history or heavy buildings. The groups are lithe, flexible, not constrained by the past or by mortar. So why shouldn’t all churches, all church groups, all faith communities, be new and fresh and young and building-less? After the flood, God promised humanity that he’d never again destroy the earth by water, he’d just deal with whatever evil schemes and habits we humans came up with, he’d work with what he had. I wonder if our old buildings and old-faith-community-habits are sort of like that–baggage-y and frustrating, perhaps, but also demanding continuity and faithfulness of us, the people who come later on. The leaky, traditional, literally inflexible building in which I now work and worship is beautiful–there’s really no question there. It’s been excellently restored by master craftspeople, and it serves as a stunning backdrop for weekly (and daily) worship. Part of the reason I became Episcopalian was because I realized that God is the epitome of beauty, and the way that Episcopalians worship emphasizes that truth. In past ages, Cathedrals were built over the course of a lifetime, with the skills of hundreds of artisans offering their greatest gifts to the glory of God. Houses of worship are a place where the talents, skills, and gifts of God’s people can be offered back to him, and where those of us who aren’t as artistically gifted can enjoy and affirm these gifts which help us to see God’s beauty a little more clearly. Ecumenical efforts to serve the poor are a vital part of the ministry of Christ; honoring God’s beauty and the beauty he instills in human hearts is vital too. In an age where efficiency, economics, and perception hold such sway, abundant beauty is especially necessary to help humanity understand God–what better place to experience heart-rending beauty but in the sights, sounds, and words of a church service? Here’s (above) how I ended up Episcopalian. Just as our days have rhythm–wake up, eat, go to school or work, exercise, eat, socialize, sleep–and our weeks have rhythm, experiencing both new things and The Same Old Thing, so why not our worship, too? 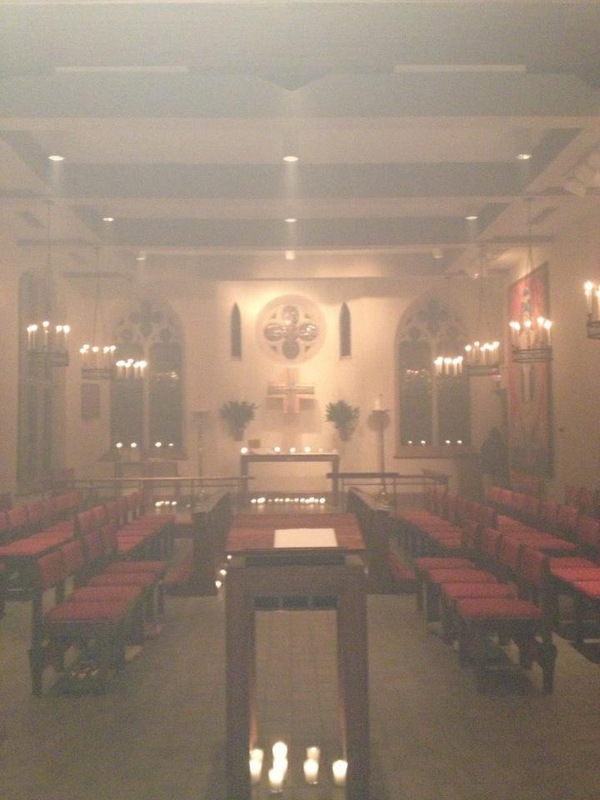 Most every church has a liturgy, whether that’s what they call it or not. Growing up, I went to a church where we’d gather on folding chairs every Sunday at 10am in an elementary school cafeteria. We’d join in singing together to the words projected on a video screen (this was new technology–no overheads with copied transparencies for us!). Afterward, we’d sit, and hear the three-point sermon our pastor had prepared. We’d pray, and then we’d pack up the cafeteria. 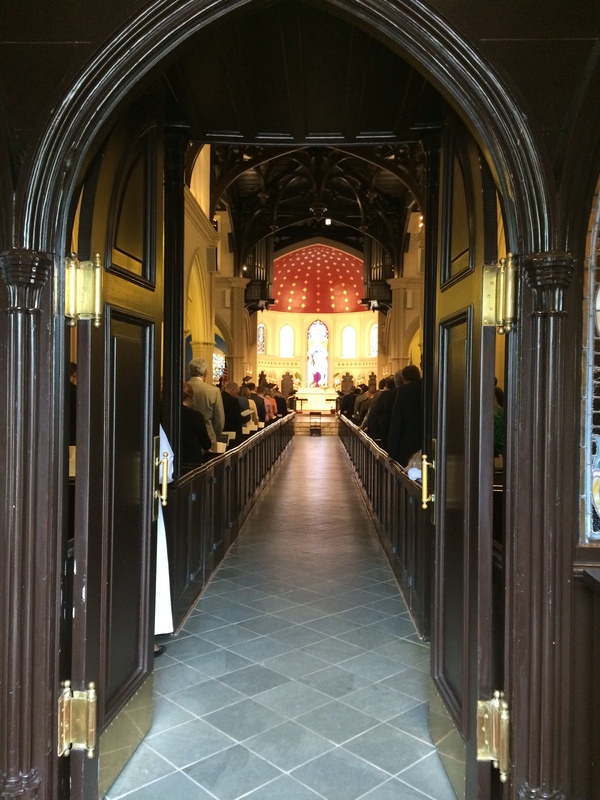 This order of service is a liturgy–it’s what we did every Sunday. In its basic form, it’s exactly what people who worship God have been doing for centuries–millenia, even–when they gather together to worship the Living God. Near the end of college, I stumbled into a Roman Catholic Church. It wasn’t totally foreign, I’d been to plenty of services growing up, but this time was different for another reason–there was something about the prayers we prayed together that made me realize that Christians had been praying that prayer to God for thousands of years. Far from such a prayer seeming worn out or prosaic, somehow, its age gave it great power. I wonder if some of its power is because it was The Same Old Thing. Everybody goes to weddings; and everybody–especially lovers of The Princess Bride–knows the first words that are said, “Dearly Beloved…”–right? When we hear those words, sometimes they sound worn out, but even when they do, we minds can’t help but jump to other times we’ve heard those same words–when Grandma and Grandpa renewed their vows, 50 years on; when you were a flower girl or ring bearer and noticed that you were at your first wedding; perhaps, when you yourself were married. It’s almost as if all those different celebrations and different moments stacked up in time one on top of the other, so that in a way, all of them were happening again in your mind’s eye. I think that’s a little bit of what Screwtape means when he says that humans experience reality successively–we think of those events as having happened on May 17, 1999 ,or April 20, 2004, or July 2, 2011–but in another way, a spiritual way, all those moments when those words align all happen at the same time. It’s not just the family members at Grandma’s and Grandpa’s renewal of vows, it’s all the people who were there the first time round and all the people who were at their parents’ weddings when those same words were said. I became part of the Anglican Communion because this messy, passionate group seeks to pray together, not only with each other, but with others around the world and throughout time–that all our prayers may, in a way, stack up on top of each other and allow us to see God more clearly by our communion. As of tomorrow, my husband and I will have lived in Columbia for a whole month (!). We’re part of the Episcopal Diocese of Upper South Carolina, and as you dear readers might know (or might not! or might not care one hoot!! which is just fine), there is an Episcopal Diocese of South Carolina, which comprises the lower part of this great state, and has been the subject and site of much upheaval in our denomination of late. There are myriad articles and essays and sermons which deal with the facts of this unfolding situation; I cannot attempt to describe or summarize them in any authoritative or competitively-excellent way. Here I share, instead, a bit of my lament. 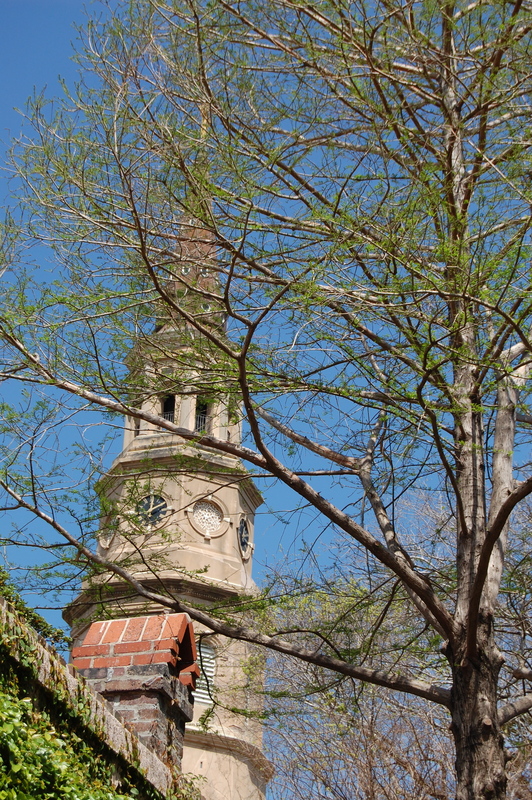 I don’t recall the first time I went to Charleston, but I know it was spring (very brilliant of me) and I know I was taken with St. Philip’s Church. Its steeple is brown and stony and majestic, its shadow is cool, its graveyard is full of wisdom. On my second or third visit, I discovered St. Michael’s Church, just a few blocks away from St. Philip’s, and stood breathless under its white outline. Old churches have always had a hold on me, and these two beautiful sacred spaces were no less gripping. Can you imagine the number of faithful people who have spent their lives praying in those pews, shuffling down those aisles, marking their births, marriages, friendships, and deaths by those walls and windows? Imagining the hundreds of years of prayers soaked into the stones and hanging in the air brings a reverent smile to my face. I close my eyes in the glow of God’s presence in these places, and how parishioners have learned of and experienced God in these spaces. Two weeks ago, I went to Charleston again, for the first time in a year. It was a big year to have not-been in Charleston (the rupture I allude to above puts the future of these buildings in jeopardy). I teared up when my husband and I pulled into a parking spot near St. Michael’s. My hands caressed the white columns, mournful of the *(figurative–not literal, yet) brokenness in which this beautiful building sits. 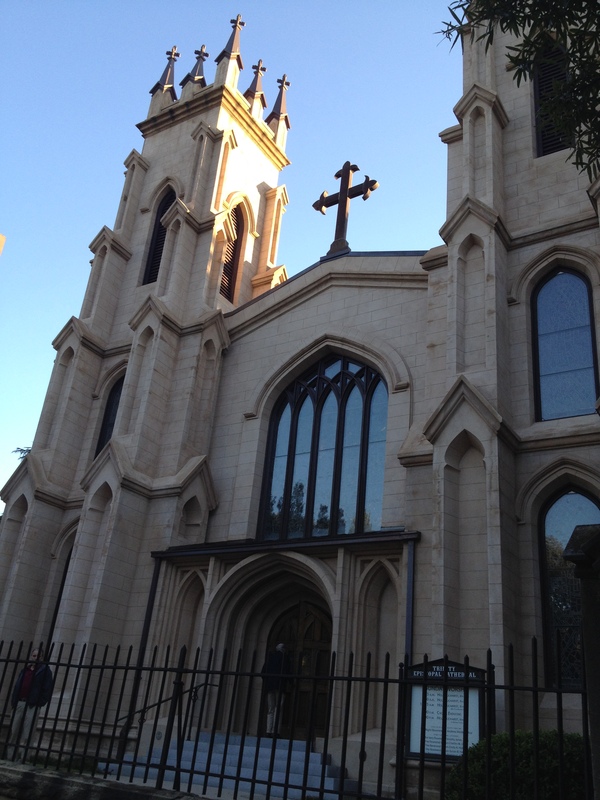 We walked to St. Philip’s Church, and I remembered my first visit–my enamored attitude with the building despite my ignorance of my call at the time. God is bigger and more full and more perfect and more sovereign than could be overcome by the loss of these buildings–of course; I know that they are just things, just symbols to us of heaven and of God’s glory, meant to aid us in our worship. However, they’ve been important symbols for centuries–they were spared General Sherman’s fire!–and now they might fall. Their stark beauty, their noble shape–these sacred spaces stand as a challenge to the passing squabbles and divisive disagreements of our day; they survived the Civil War, for heaven’s sake! The brokenness in the Episcopal Church these days is not just a passing squabble or a disagreement, we’re struggling with what it means to love and what it means for Scripture to be authoritative. For at least two thousand years, we’ve been struggling with these things, as Christians, and there has been lots of collateral damage–plenty of lives, which are more important than any building. But I really hope that these buildings can continue to stand as a witness to us little people of God’s glory, his power, his far-reaching love, and his desire that all may be made one body with him. When the Gospel passage of the Transfiguration was read last Saturday evening during our Vigil service, another one of the imports of incense dawned on me. 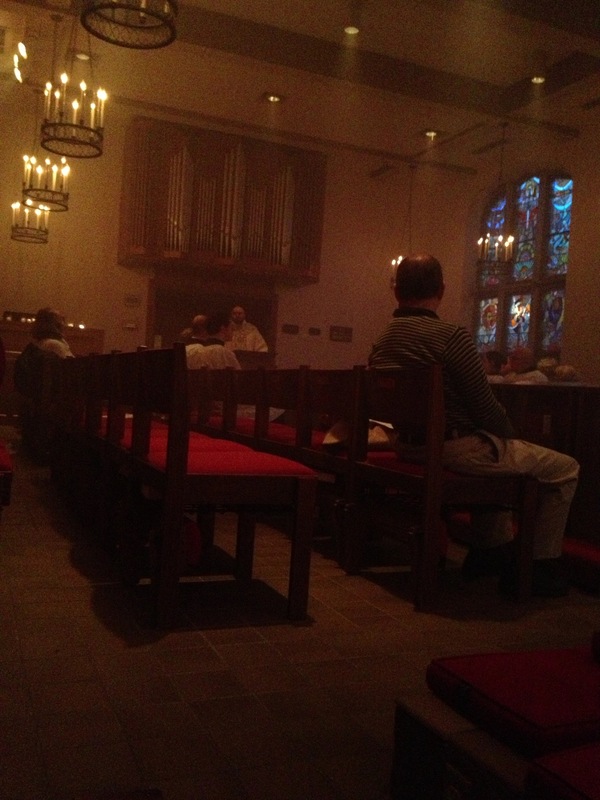 I happened to be thurifer last week, making me the cloud-maker for the evening; throughout the service, as the incense swirled around us, we quite literally entered a cloud. The smelly (in a good way, to my nose) incense enveloped us and we dwelt in the closest thing to a blanket of mist that people can easily create themselves. That’s why we use incense (among many other reasons). It moves us into the cloud. It’s not just any cloud. As we read in our Isaiah Bible study this week (ch. 19), God’s communication with humanity is often through a cloud (this was a big-deal connection to the Church Fathers–see Cyril of Alexandria, Gregory of Nyssa, John Chrysostom)–like the pillar of cloud that led the Israelites through the wilderness, God speaking out of a cloud at Jesus’ baptism, and God and Moses communicating through a cloud on Mount Sinai. Clouds are often used in Scripture to remind us that God is near and so we use cloud, in incense, to remind us that God is in our midst when we worship together.